ATLANTA, GA. November 18, 2015 – The Oblander Group is pleased to offer its congratulation to Charleston, SC Mayor-Elect, John Tecklenburg upon his victory in yesterday’s runoff election. 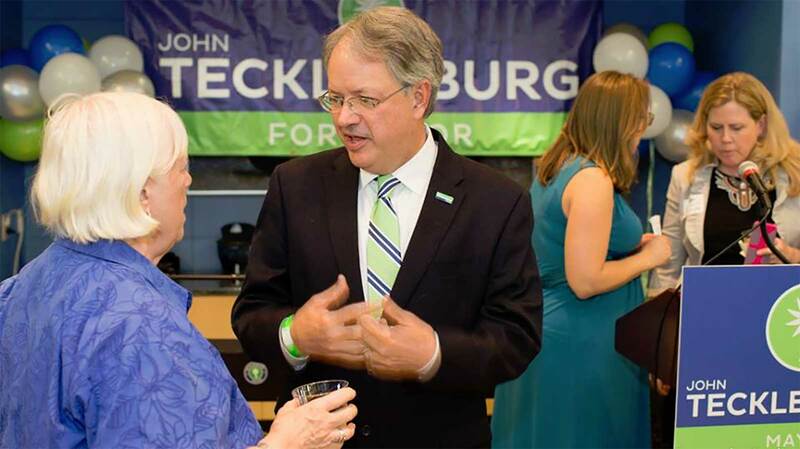 Mr. Tecklenburg defeated SC State Representative Leon Stavrinakis 57.5% to 42.5% with all precincts reporting. Mayor-Elect Tecklenburg will serve as Charleston’s first new mayor in forty years, taking over for Mayor Joseph Riley on January 11, 2016. Brought on board as the campaign’s political fundraising agency, The Oblander Group applied proven fundraising techniques, events and messaging to connect the campaign with supporters willing to invest in the future of Charleston. Headquartered in Atlanta, Georgia, The Oblander Group if a full-service progressive political and non-profit organization fundraising firm. Founded by Kristin Oblander in 1999, Oblander group clients, past and present, include serving on the National Finance Committee of The Obama Victory Fund, the Democratic National Committee, U.S. Congressman John Lewis, and U.S. Congressman Sanford Bishop. The Oblander Group raised over $22 Million for Georgia Governor Roy Barnes re-election campaign in 2002 – still the all-time fundraising record in the state of Georgia. Kristin Oblander is President of The Oblander Group. Named by “Campaigns and Elections” magazine as a “Rising State in Politics”, Ms. Oblander is considered one of the premiere fundraising professionals in the United States. Ms. Oblander is a founding board member of the National Association of Fundraising Professionals, and a has been a featured fundraising speaker at many national training seminars and conferences including: the White House Project, the Legislative Candidate Training for the Georgia Democratic Party, the Burris School of Government Candidate Training, the Stennis Center for Southern Women in Public Service, the Campaigns & Elections Political Training Seminar, the New Leader’s Council and the National Center for Transportation Excellence. Ms. Oblander holds a Bachelor of Science in Management at Georgia Tech and resides in Atlanta with her husband Bill Sengstacken.